The Monteverde Stylus Mechanical Tool Pencil Is Packed With Handy Features For Working At Your Desk And Around The House. The Monteverde Stylus Mechanical Tool Pencil is cleverly designed pencil from Monteverde includes nine useful tools in one premium writing instrument ! The Monteverde Stylus Mechanical Tool Pencil is excellent for professionals or students, and is also favored by draftsmen, architects, artists, Carpenter's, Handymen and builders and trades people for its functionality and reliability– it comes with Monteverde's lifetime guarantee. In a fast paced world, having the right tools at hand is crucial, and The Monteverde Stylus Mechanical Tool Pencil 0.9 mm Pencil brings 9 functions in one premium quality writing instrument! Intriguing tool of the American home Monteverde available as mechanical pencil 0.9 mm, stylus touch, measurement scale ruler on the stem, eraser and screwdriver. Available colors for the ball yellow, black, silver and red. For the mechanical pencil that does not have level colors are black, yellow and aluminum. The Monteverde Stylus Mechanical Tool Pencil is a pretty unique mechanical pencil which Monteverde has come up with. It integrates multiple tools into one product. Part of Monteverde's Tool Pencil line of clever multi-functional writing instruments, this mechanical pencil is packed with handy features for working at your desk and around the house. A twist-action pencil tip with a thick, break-resistant 0.9 mm lead, perfect for marking, sketching, and writing. The pencil holds one piece of lead at a time, and can be pulled out of the barrel, letting you draw with the pencil while using the barrel as a straight edge. To pull the pencil out of the barrel, grip it by the knurled section of the pencil tip and pull it straight out of the barrel. An eraser on the end of the pencil component, which can be used when the pencil is pulled out of the barrel. A capacitive stylus for use with smart phones, tablets, and other capacitive touch screen devices. A screwdriver with a double-sided flat-head and Phillips bit. The screwdriver is accessed by unscrewing the stylus tip, which can be screwed onto the pencil tip while the screwdriver is being used. A weighty metal body with a hexagonal shape that is comfortable to hold and keeps the pencil from rolling away. Four scale rulers printed on the sides of the barrel: inches, centimeters (1/100 m), half-centimeters (1/200 m), and third-centimeters (1/300 m). A sturdy metal clip for attaching the pencil to a pocket, strap, or tool belt. The eraser, stylus, and screwdriver bit are all replaceable. Replacements can be found under Recommended Refills/Parts..
On the end of the mechanical pencil section is a small eraser. If you pull the eraser out you can fill the pencil with lead. The lead is a 0.9mm so it is a little wider lead but it was designed for use on the work site if that is what you use it for or if you are a do-it-yourselfer. To change the lead on this mechanical pencil it is a compression fit tip so we simply pull that tip out of the barrel. It is quite long so you see it takes up most of the barrel leaving no room for the bubble level on the top of the barrel where it fits on the Monteverde One Touch Stylus Tool pens. The Monteverde Stylus Mechanical Tool Pencil is a great gift idea this holiday season. Ideal pencil for Carpenters and Handymen. With the 0.9mm lead its perfect for marking a board on the job site so that it can be easily cut. The 0.9mm lean make a heavy dark line that is easy to see even on the job site when saw dust is flying around. Also Used by artists, architects, Carpenter's, Handymen and builders, this is a great pencil for anyone who is handy. 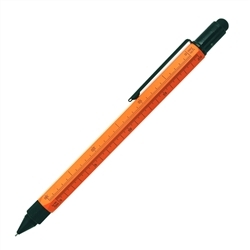 This is a unique pencil that is weighty and solid in your hand. 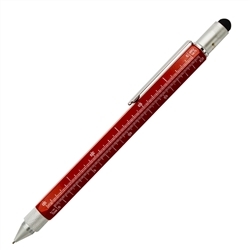 Choose from a mechanical pencil, ballpoint pen, ink cartridge roller ball or fountain pen.